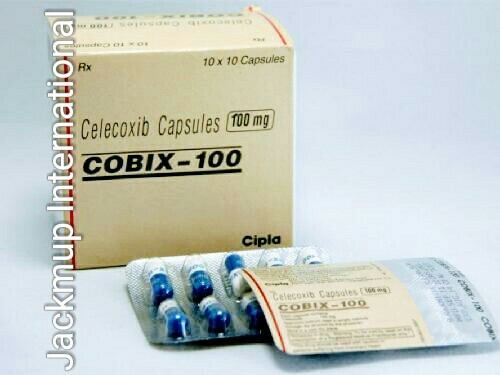 Description:- Cobix 100 mg capsule is used in osteoarthritis, rheumatoid arthritis, ankylosing spondylitis, gout, arthralgia, myalgia, pain during menstruation and post operative pain.It blocks the release of certain chemical messengers that are responsible for pain and inflammation (redness and swelling). Do not take celecoxib, if you are allergic to celecoxib or to any other content in the medicine or to ‘Sulfonamide’ class of antibiotics. Do not take celecoxib, if you have ulcers or bleeding in your stomach or intestines; asthma, breathing problems, nasal congestion, nasal polyps or allergic reactions after taking NSAIDs. Do not take celecoxib, if you have severe kidney or liver disease, heart conditions, heart attack or stroke; problems with the blood circulation or had a surgery on the arteries in your legs. Do not take celecoxib, if you have inflammation of intestines like Ulcerative colitis or Crohn’s disease. Avoid using celecoxib, if you are pregnant or planning to become pregnant or breast-feeding a baby. Side Effects:- Abdominal pain, Palpitations, Nausea, Vomiting, Headache, Gastritis, Heartburn, Edema, Dyspepsia, Flatulence, Increased blood pressure, Dizziness, Constipation, Diarrhoea.